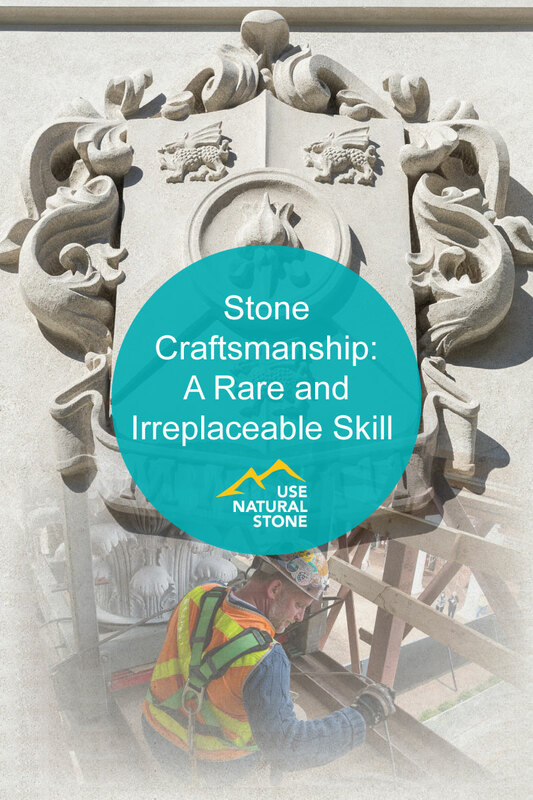 Stone carving—the fine art of chiseling natural stone into intricate, interwoven leaves atop a column of angels gracing a cathedral portico—is uncommon enough that some people believe the craft no longer exists. But though fewer in number than they were in the glory days of the 1800s and earlier, stone carvers are still working, and their skills are indispensable. Using a combination of modern machinery and ancient craftsmanship, they restore churches, universities, and city buildings to their former magnificence. 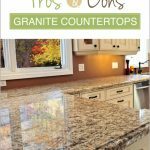 Increasingly, they are also plying their trade in high-end homes and commercial buildings whose owners want a distinctive, majestic touch. Photo courtesy of Red Leaf Stone. Tony Rogac, a stone carver who works for the Red Leaf Group in Vancouver, has been working with stone since he trained with a firm restoring Worcester Cathedral in his native England over 40 years ago. He has done everything from restoration work to elaborately carved fireplaces for high-end homes and heraldic crests for modern businesses. “It’s a skill, but also an art—you have a little license in the execution,” he says of stone carving. His projects are many and varied. 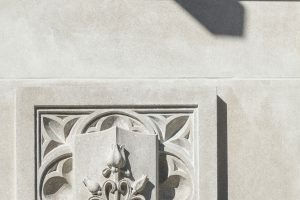 In Gastown, an old part of Vancouver, he rebuilt an ornate arch with floral carving above a building dating to the 1860s gold rush, carving flowers and griffins into 80,000 pounds of Indiana limestone. For the Vermeer, an award-winning retail and condo complex built four years ago in Vancouver, he carved medieval-looking shields embedded with tulips and dragons. He is currently working on a stone cougar that will crouch above Red Leaf’s own entrance. Like most of today’s artisans, Rogac usually does his fine hand carving after a modern machine has done its work. The computer numeric control router, or CNC, as it’s known in the trade, is a machine with a rotating blade guided by software that contains files with design specifications. It does about 80 percent of the carving for most jobs. 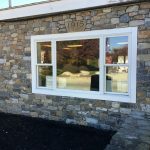 “You might think an old stone mason would be a Luddite, but I think the CNC is a great aid,” he said. Hand carving is essential for achieving an authentic, intricate look. “It’s a marriage of machinery and craftsmanship,” said Steffen Waite, Red Leaf Group’s owner. Few clients would be able to afford sculptures and bas-reliefs carved entirely by hand, he added. Photo Courtesy of Rugo Stone. Because of their high visibility and prominence, stone carvings have to be done with extreme care. Nowhere is this truer than at the Rotunda, the centerpiece of the Thomas Jefferson-designed University of Virginia, which is a United Nations World Heritage site. 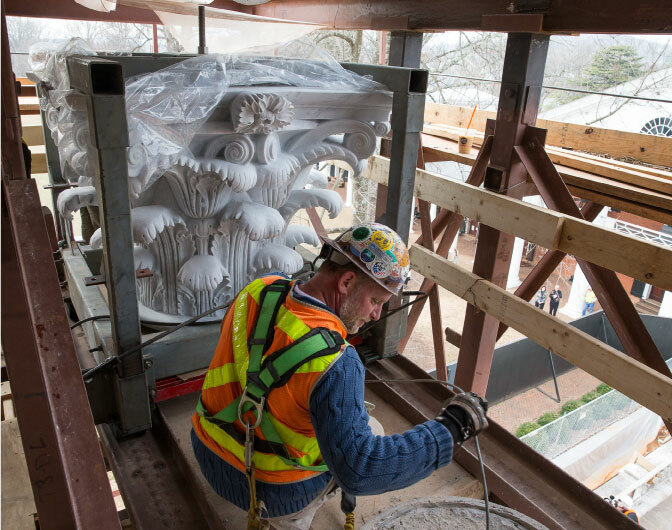 The Rotunda’s 16 original Carrara marble Corinthian capitals were destroyed in an 1895 fire that also consumed much of the rest of the building. 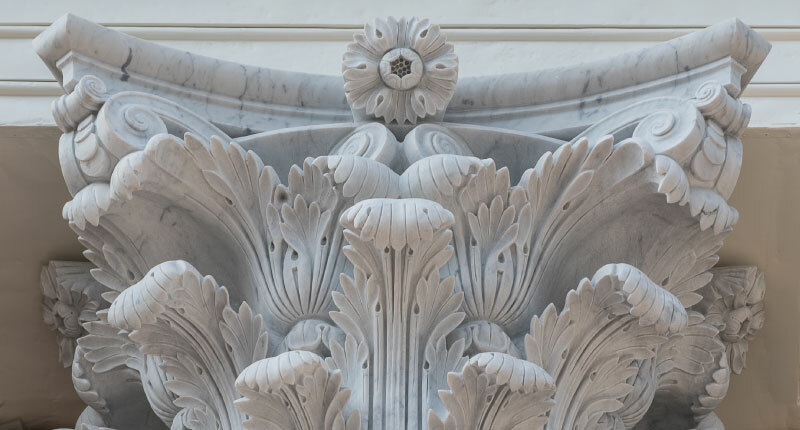 Renowned architect Stanford White restored the building, but over a hundred years later, the carved acanthus leaves over the capitals had eroded and begun to fall off, posing a safety hazard. Last year, Virginia firm Rugo Stone did a 3D scanning of the bits and pieces of capital tops that remained. Workers gleaned what they could from an 1895 distance photograph. The company hired carvers from Italy, whose sketches and models had to go through layers of approval. In the end, the capitals were restored to their former glory in a style experts believe Jefferson would have approved of, though his original drawings no longer exist. 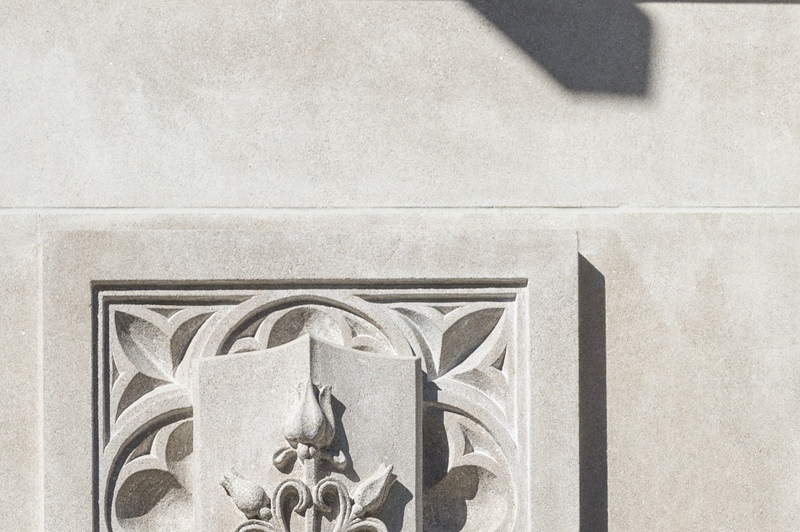 Like Red Leaf, Rugo Stone also does stone carving in high-end homes, which have become its major source of business. Another source of demand is churches, which need skilled hands to carve sculptures of religious figures. Rugo is currently restoring several elaborately carved chapels at the Basilica of the National Shrine of the Immaculate Conception in Washington, DC and has done carvings for many other churches, as well as for Duke University’s Divinity School. The art of carving stone is traditionally passed from generation to generation through apprenticeships, but with fewer stonemasons left to pass on their skills, its survival is uncertain. 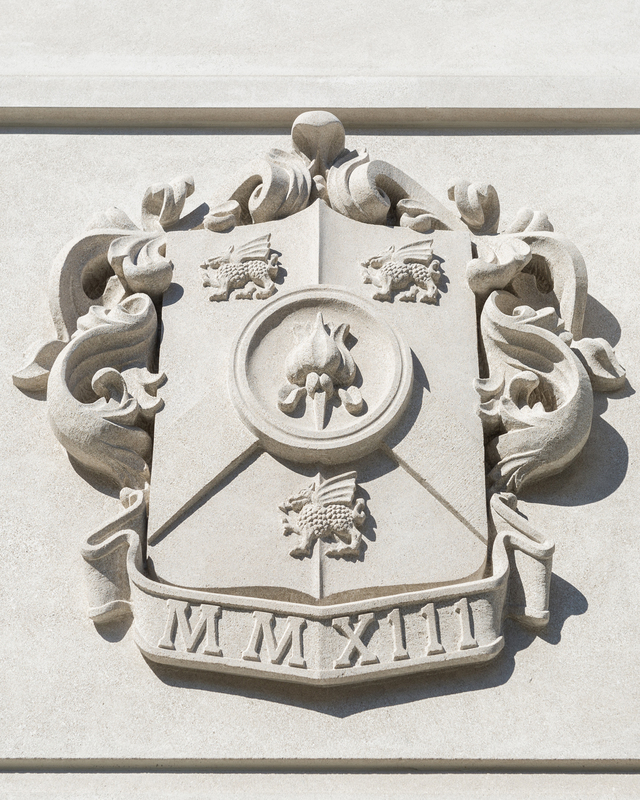 In the United States, the American College of Building Arts offers bachelor’s degrees in classic building trades, including architectural stone carving. In Ireland, an entrepreneur opened a Stone Mastery Academy, enabling passionate practitioners to transmit their knowledge. 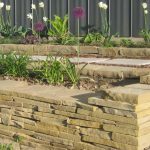 As long as people are drawn to natural stone, there will be plenty of work available for those with the right skills and experience.